The U.S. Postal Service uses Area Mail Processing (AMP) guidelines to consolidate mail processing functions and increase productivity through more efficient use of equipment, facilities, staffing, and transportation. These consolidations are intended to reduce costs and maintain quality service. The Postal Service finished consolidating the Panama City, FL, Processing and Distribution Facility (P&DF) into the Pensacola, FL, Processing and Distribution Center (P&DC) on April 1, 2013. This report responds to a request from Congresswoman Gwen Graham to review the consolidation. Our objectives were to determine whether a business case existed to consolidate mail processing operations from the Panama City P&DF into the Pensacola P&DC and assess compliance with established AMP guidelines. A business case existed to support consolidating the Panama City, FL, P&DF. We estimated the consolidation should save the Postal Service about $3.4 million annually, which is $55,782 more than the Postal Service estimated. We found the Postal Service overestimated mail processing craft workhour savings and underestimated transportation savings. Also, we found the Postal Service underestimated one-time costs by $55,088. 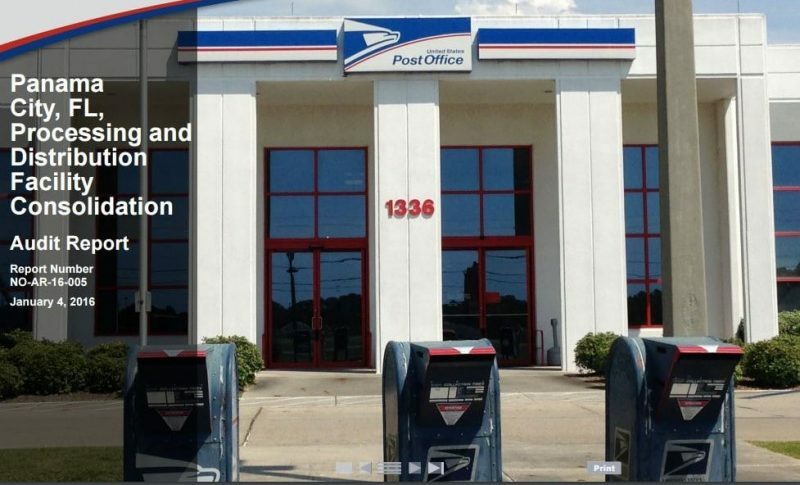 We also found the Pensacola P&DC has adequate machine capacity to process the additional mail from the Panama City P&DF and the Postal Service did not lay off any career employees as a result of the consolidation. In addition, the consolidation did not substantially impact the community and the Postal Service generally complied with established AMP guidelines. We also found that productivity decreased at the Pensacola P&DC. In addition, the consolidation resulted in improved service standards. However, service performance slightly declined after the consolidation. We recommended the vice president, Southern Area, adjust staffing and workhours at the Pensacola P&DC to ensure productivity targets are achieved and adjust transportation and other operational requirements to ensure the Pensacola P&DC meets service commitments. This entry was posted in Downsizing USPS, General Union Business and tagged AMP, Area Mail Processing, closures, Congresswoman Gwen Graham, consolidations, Panama City P&DF, Pensacola P&DC, reduced service standards, service performance, USPS OIG Audit Report. Bookmark the permalink.